With families looking forward to fun backyard activities and get-togethers this summer, it’s important to make sure your lawn is able to hold up to the increased foot traffic. To help you get the most out of your lawn this summer, Edward Gosman & Associates, Inc., would like to share some simple tips that will help you grow a thick, healthy lawn that can stand up to anything. Just like us, your lawn needs oxygen to grow and flourish. Aerating effectively pokes small, discrete holes in the ground, through which air, water, and nutrients are able to more easily reach the roots. This process also gives roots more room to grow and reproduce, which in turn aids in absorption of water and nutrients, giving you strong, well-established plants that are more resistant to weeds and drought. Sometimes the soil doesn’t provide all the nutrients it needs to achieve optimal strength and growth. Prepare for the summer growing season and give your lawn a boost this spring by applying some fertilizer. Soak the ground beforehand to maximize absorption, then spread the fertilizer evenly over the grass. If you are overwhelmed by the choices and aren’t sure which combination of nutrients your lawn needs, consult an employee at a local nursery or lawn and garden center for recommendations. You can also take a sample of your soil to your local extension center to get its pH levels tested. At Edward Gosman & Associates, not only are we experts at landscape design and renovation, we also provide property maintenance services. 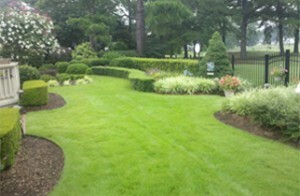 If you want a thick, luxurious lawn but don’t have to have the time or energy to put into it, give us a call at 757-421-2500 and we’ll take care of it for you. This entry was posted in Uncategorized on May 22, 2017 by Edward Gosman & Associates. This is a family owned local company!! Great service, great people, and great prices!! Always on time and take excellent care of you like family!!! I would give my highest recommendation to my closest family and friends to use this company! And I do.